Fascism ( IPA: [ˈfæʃɪzm]) is a radical political ideology that combines elements of corporatism, authoritarianism, nationalism, militarism, anti-liberalism and anti-communism. The word fascism stems from the Italian word fascio (plural: fasci), which may mean bundle, as in a political or militant group, or a nation. The term also comes from the fasces (rods bundled around an axe), which was an ancient Roman symbol of the authority of magistrates. The symbolism of the fasces suggested strength through unity; a single rod is easily broken, while the bundle is very difficult to break. Originally, the term fascism was used by an Italian political movement that ruled Italy from 1922 to 1943 under the leadership of Benito Mussolini (see Italian fascism). Later, fascism became a more generic term that was meant to cover an entire class of authoritarian political ideologies, parties, and political systems, though no consensus was ever achieved on a precise definition of what it means to be "fascist". Various scholars have sought to define fascism, and a list of such definitions can be found in the article definitions of fascism. Part of the difficulty arises from the fact that today there are very few self-identified fascists. The word has become a slur throughout the political spectrum since the defeat of the Axis powers in World War II, and it has been extremely uncommon for any political groups to call themselves fascist since 1945. In contemporary political discourse, adherents of some political ideologies tend to associate fascism with their enemies, or define it as the opposite of their own views. There are no major self-proclaimed fascist parties or organizations anywhere in the world. The governments and parties most often considered to have been fascist include Nazi Germany under Adolf Hitler, Spain's Falange, Portugal's Estado Novo, Hungary's Arrow Cross Party, Romania's Iron Guard, and other similar movements that existed across Europe in the 1920s and 1930s. Some authors reject this broader use of the term or exclude certain of these parties and regimes. The term fascism is sometimes applied (by both supporters and opponents) to other authoritarian regimes of the same period, such as those of Imperial Japan under Hideki Tojo and Austria under Engelbert Dollfuss, or somewhat later, Argentina under Juan Perón and Greece under Ioannis Metaxas. Its use for similar, but longer-lived, regimes such as Spain under Francisco Franco and the Estado Novo of António de Oliveira Salazar in Portugal, is widespread among opponents of those regimes, but often disputed by supporters and by some historians. This trend toward the term being used only by opponents is even more pronounced in the case of more recent authoritarian regimes, such as Indonesia under Suharto. Although the broadest definitions of fascism may include every authoritarian state that has ever existed, most theorists see important distinctions to be made. Fascism in Italy arose in the 1920s as a mixture of syndicalist notions with an anti- materialist theory of the state; the latter had already been linked to an extreme nationalism. Fascism in many ways seems to have been clearly developed as a reaction against Communism and Marxism, both in a philosophic and political sense, although it opposed democratic capitalist economics along with socialism, Marxism, and liberal democracy. It viewed the state as an organic entity in a positive light rather than as an institution designed to protect collective and individual rights, or as one that should be held in check. It tended to reject the Marxist notion of social classes and universally dismissed the concept of class conflict, replacing it instead with the struggle between national ethic and agenda, on the one hand, and individualistic liberalism, on the other. This meant embracing nationalism and mysticism, and advancing ideals of strength and power as means of legitimacy, glorifying war as an end in itself and victory as the determinant of truth and worthiness. An affinity to these ideas can be found in Social Darwinism. These ideas are in direct opposition to the ideals of humanism and rationalism characteristic of the Age of Enlightenment, from which liberalism and, later, Marxism would emerge. Fascism is also considered to be a form of collectivism. Fascism is also typified by totalitarian attempts to impose state control over all aspects of life: political, social, cultural, and economic; in the examples given, by way of a strong, single-party government for enacting laws and a strong, sometimes brutal militia or police force for enforcing them. Fascism exalts the nation, state, or group of people as superior to the individuals, institutions, or groups composing it. Fascism uses explicit populist rhetoric; calls for a heroic mass effort to restore past greatness; and demands loyalty to a single leader, leading to a cult of personality and unquestioned obedience to orders ( Führerprinzip). Hannah Arendt classed Italian fascism as an ordinary authoritarian ideology, and included only Stalinism and Nazism as totalitarians. Fascism attracted political support from diverse sectors of the population, including big business, farmers and landowners, nationalists, and reactionaries, disaffected World War I veterans, intellectuals such as Gabriele D'Annunzio, Curzio Malaparte, Filippo Tommaso Marinetti, Carl Schmitt and Martin Heidegger to name a few, conservatives and small businessmen, and the masses to whom they promised work and bread. In countries such as Romania and Hungary (and to a lesser extent in other states), Fascism had a strong base of support among the working classes and extremely poor peasants. The word has become a slur throughout the political spectrum since the failure of the Axis powers in World War II, and it has been extremely uncommon for any political groups to call themselves "fascist" since 1945. In contemporary political discourse, adherents of some political ideologies tend to associate fascism with their enemies, or define it as the opposite of their own views. In the strict sense of the word, Fascism covers movements before WWII; later movements qualified themselves as Neo-fascists. Many diverse regimes have identified themselves as fascist, and defining fascism has proved complicated and contentious. Historians, political scientists, and other scholars have engaged in long and furious debates concerning the exact nature of fascism and its core tenets. Since the 1990s, however, there has been a growing move toward some rough consensus reflected in the work of Stanley Payne, Roger Eatwell, Roger Griffin, and Robert O. Paxton. See Fascism and ideology. The Italian Fascisti were also known as Blackshirts for their style of uniform incorporating a black shirt (See Also: political colour). Merriam-Webster defines fascism as "a political philosophy, movement, or regime (as that of the Fascisti) that exalts nation and often race above the individual and that stands for a centralized autocratic government headed by a dictatorial leader, severe economic and social regimentation, and forcible suppression of opposition". "Fascism may be defined as a form of political behaviour marked by obsessive preoccupation with community decline, humiliation, or victim-hood and by compensatory cults of unity, energy, and purity, in which a mass-based party of committed nationalist militants, working in uneasy but effective collaboration with traditional elites, abandons democratic liberties and pursues with redemptive violence and without ethical or legal restraints goals of internal cleansing and external expansion." "1. a sense of overwhelming crisis beyond reach of traditional solutions; 2. belief one’s group is the victim, justifying any action without legal or moral limits; 3. need for authority by a natural leader above the law, relying on the superiority of his instincts; 4. right of the chosen people to dominate others without legal or moral restraint; 5. fear of foreign `contamination." "Anti-individualistic, the fascist conception of life stresses the importance of the State and accepts the individual only in so far as his interests coincide with those of the State, which stands for the conscience and the universal will of man as a historic entity.... Liberalism denied the State in the name of the individual; fascism reasserts the rights of the State as expressing the real essence of the individual. And if liberty is to be the attribute of living men and not abstract dummies invented by individualistic liberalism, then fascism stands for liberty, and for the only liberty worth having, the liberty of the State and of the individual within the State. The fascist conception of the State is all-embracing; outside of it no human or spiritual values can exist, much less have value. Thus understood, fascism… interprets, develops, and potentiates the whole life of a people.... Fascism is therefore opposed to that form of democracy which equates a nation to the majority, lowering it to the level of the largest number; but it is the purest form of democracy if the nation be considered – as it should be – from the point of view of quality rather than quantity, as an idea, the mightiest because the most ethical, the most coherent, the truest, expressing itself in a people as the conscience and will of the few, if not, indeed, of one, and tending to express itself in the conscience and will of the mass, of the whole group ethnically molded by natural and historical conditions into a nation, advancing as one conscience and one will, along the self-same line of development and spiritual formation. Not a race, or a geographically defined region, but a people, historically perpetuating itself; a multitude unified by an idea and imbued with the will to live, the will to power, self-consciousness, personality...."
"Granted that the 19th century was the century of socialism, liberalism, democracy, this does not mean that the 20th century must also be the century of socialism, liberalism, democracy. Political doctrines pass; nations remain. We are free to believe that this is the century of authority, a century tending to the 'right', a Fascist century. If the 19th century was the century of the individual (liberalism implies individualism) we are free to believe that this is the 'collective' century, and therefore the century of the State." Stanley Payne's Fascism: Comparison and Definition (1980) uses a lengthy itemized list of characteristics to identify fascism, including the creation of an authoritarian state; a regulated, state-integrated economic sector; fascist symbolism; anti-liberalism; anti-communism. A similar strategy was employed by semiotician Umberto Eco in his popular essay Eternal Fascism: Fourteen Ways of Looking at a Blackshirt. More recently, an emphasis has been placed upon the aspect of populist fascist rhetoric that argues for a "re-birth" of a conflated nation and ethnic people. Most scholars hold that fascism as a social movement employs elements from the political left, but many conclude that fascism eventually allies with the political right, especially after attaining state power. This is even more complicated when discussing Nazism, which as a socio-political movement began as a form of National Socialism, but altered its character once Hitler was handed state power in Germany. See: Fascism and ideology. A minority of scholars and political commentators argue that fascism is a form of corporatist socialism similar to that in other countries with extensive state regulation of the economy. See Fascism and ideology and Economics of fascism. After the defeat of Fascist Italy and Nazi Germany in World War II, the term has taken on an extremely pejorative meaning, largely in reaction to the crimes against humanity committed by the Nazis. Today, very few groups proclaim themselves fascist, and the term is often used to describe individuals or political groups who are perceived to behave in an authoritarian or totalitarian manner; by silencing opposition, judging personal behaviour, promoting racism, or otherwise attempting to concentrate power and create hate towards the "enemies of the state". Because of the term's use as a pejorative, there is a great deal of controversy surrounding the question of what political movements and governments belong to fascism. Fascio (plural: fasci) is an Italian language word which was used in the late 19th century to refer to radical political groups of many different (and sometimes opposing) orientations. A number of nationalist fasci later evolved into the 20th century movement known as fascism. Mussolini claimed to have been the founder of fascism. 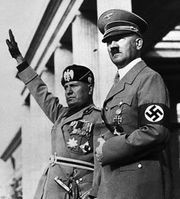 Italian fascism (in Italian, fascismo) was the authoritarian political movement which ruled Italy from 1922 to 1943 under the leadership of Benito Mussolini. Fascism in Italy combined elements of corporatism, totalitarianism, nationalism, militarism, and anti-Communism. Fascism won support as an alternative to the unpopular Liberalism of the time. It also won support of Italians who were anti socialist. The extent and nature of the affinity between Fascism and Nazism has been the subject of much academic debate. Although the modern consensus sees Nazism as a type or offshoot of fascism, there are some experts, like Allardyce or Organski, who argue that Nazism is not fascism, either on the grounds that the differences are too great, or because they disagree that fascism can be generic. Nazism differed from Italian Fascism in the emphasis on the state's purpose in serving its national ideal on the basis of a national race, specifically the social engineering of culture to the ends of the greatest possible prosperity for the Germanic race at the expense of all else and all others. In contrast, Mussolini's Fascism held that cultural factors existed to serve the state, and that it wasn't necessarily in the state's interest to serve or engineer any of these particulars within its sphere. The only purpose of government under Fascism was to uphold the state as supreme above all else, and for these reasons it can be said to have been a governmental statolatry. Where Fascism talked of "State," however, Nazism spoke of the " Volk" and of the Volksgemeinschaft (the "national community"). While Nazism saw both party and government as a means to achieve an ideal condition for certain chosen people, fascism was a squarely anti-socialist form of statism that existed as an end in and of itself. The Nazi movement, at least in its overt ideology, spoke of class-based society as the enemy, and wanted to unify the racial element above established classes. The Fascist movement, on the other hand, sought to preserve the class system and uphold it as the foundation of established and desirable culture , although this is not to say that Fascists rejected the concept of social mobility. Indeed a central tenet of the Corporate State was meritocracy. However, Fascism also heavily based itself on corporatism, which was supposed to supersede class conflicts. Mussolini and Hitler weren't always allies, as France under Pierre Laval tried to ally itself with Italy against Germany, leading to the 1935 Stresa Front (UK, France, Italy). This seemed to be especially the case in 1934 when Engelbert Dollfuss the Austrofascist leader of Austria was assassinated by Nazi Brown shirts on Hitler's orders in preparation for a planned Anschluss, which prompted Mussolini to move troops to the Austrian-Italian border in readiness for war with Hitler. Also when Hitler and Mussolini first met Mussolini referred to Hitler as 'a silly little monkey' before he was forced by the Western Allies into an agreement with Hitler. Fascism and Communism are political systems that rose to prominence after World War I. Historians of the period between World War I and World War II such as E.H. Carr and Eric Hobsbawm point out that liberalism was under serious stress in this period and seemed to be a doomed philosophy. The success of the Russian Revolution of 1917 resulted in a revolutionary wave across Europe. The socialist movement worldwide split into separate social democratic and Leninist wings. The subsequent formation of the Third International prompted serious debates within social democratic parties, resulting in supporters of the Russian Revolution splitting to form Communist Parties in most industrialized (and many non-industrialized) countries. At the end of World War I, there were attempted socialist uprisings or threats of socialist uprisings throughout Europe, most notably in Germany, where the Spartacist uprising, led by Rosa Luxemburg and Karl Liebknecht in January 1919, was eventually crushed. In Bavaria, Communists successfully overthrew the government and established the Munich Soviet Republic that lasted from 1918 to 1919. A short lived Hungarian Soviet Republic was also established under Béla Kun in 1919. The Russian Revolution also inspired attempted revolutionary movements in Italy with a wave of factory occupations. Most historians view fascism as a response to these developments, as a movement that both tried to appeal to the working class and divert them from Marxism. It also appealed to capitalists as a bulwark against Bolshevism. Italian Fascism took power with the blessing of Italy's king after years of leftist-led unrest led many conservatives to fear that a communist revolution was inevitable ( Marxist philosopher Antonio Gramsci popularized the conception that fascism was the Capital's response to the organized workers' movement). Mussolini took power during the 1922 March on Rome. Throughout Europe, numerous aristocrats, conservative intellectuals, capitalists and industrialists lent their support to fascist movements in their countries that emulated Italian Fascism. In Germany, numerous right-wing nationalist groups arose, particularly out of the post-war Freikorps, which were used to crush both the Spartacist uprising and the Munich Soviet. With the worldwide Great Depression of the 1930s, it seemed that liberalism and the liberal form of capitalism were doomed, and Communist and fascist movements swelled. These movements were bitterly opposed to each other and fought frequently, the most notable example of this conflict being the Spanish Civil War. This war became a proxy war between the fascist countries and their international supporters — who backed Francisco Franco — and the worldwide Communist movement allied uneasily with anarchists and Trotskyists — who backed the Popular Front — and were aided chiefly by the Soviet Union. Initially, the Soviet Union supported a coalition with the western powers against Nazi Germany and popular fronts in various countries against domestic fascism. This policy was largely unsuccessful due to the distrust shown by the western powers (especially Britain) towards the Soviet Union. The Munich Agreement between Germany, France and Britain heightened Soviet fears that the western powers were endeavoring to force them to bear the brunt of a war against Nazism. The lack of eagerness on the part of the British during diplomatic negotiations with the Soviets served to make the situation even worse. The Soviets changed their policy and negotiated a non-aggression pact known as the Molotov-Ribbentrop Pact in 1939. Vyacheslav Molotov claims in his memoirs that the Soviets believed this was necessary to buy them time to prepare for an expected war with Germany. Stalin expected the Germans not to attack until 1942, but the pact ended in 1941 when Nazi Germany invaded the Soviet Union in Operation Barbarossa. Fascism and communism reverted to being deadly enemies. The war, in the eyes of both sides, was a war between ideologies. Even within socialist and communist circles, there were debates about the nature of fascism. Communist theoretician Rajani Palme Dutt crafted one view that stressed the crisis of capitalism. Leon Trotsky, an early leader in the Russian Revolution, believed that fascism occurs when "the workers' organizations are annihilated; that the proletariat is reduced to an amorphous state; and that a system of administration is created which penetrates deeply into the masses and which serves to frustrate the independent crystallization of the proletariat." Some expressions of fascism have been closely linked with religious political movements. This combination is referred to as Clerical fascism, a prime example of which is the Ustashe in Croatia. A controversial topic is the relationship between fascist movements and the Roman Catholic Church. As mentioned above, Pope Leo XIII's 1891 encyclical, Rerum Novarum included doctrines that fascists used or admired. Forty years later, the corporatist tendencies of Rerum Novarum were underscored by Pope Pius XI's May 25, 1931 encyclical Quadragesimo Anno restated the hostility of Rerum Novarum to both unbridled competition and class struggle. Apologists claim the criticism of both socialism and capitalism in these encyclicals was not fascist but rather closer to Christian Democracy. In the early 1920s, the Catholic party in Italy (Partito Popolare) was in the process of forming a coalition with the Reform Party that could have stabilized Italian politics and thwarted Mussolini's projected coup. On October 2, 1922, Pope Pius XI circulated a letter ordering clergy not to identify themselves with the Partito Popolare, but to remain neutral, an act that undercut the party and its alliance against Mussolini. Following Mussolini's rise to power, the Vatican's Secretary of State met Il Duce in early 1923 and agreed to dissolve the Partito Popolare, which Mussolini saw as an obstacle to fascist rule. In exchange, the fascists made guarantees regarding Catholic education and institutions. In 1924, following the murder of the leader of the Socialist Party by fascists, the Partito Popolare joined with the Socialist Party in demanding that the King dismiss Mussolini as Prime Minister, and stated their willingness to form a coalition government. Pius XI responded by warning against any coalition between Catholics and socialists. The Vatican ordered all priests to resign from the Partito Popolare and from any positions they held in it. This led to the party's disintegration in rural areas where it relied on clerical assistance. The Vatican subsequently established Azione Cattolica (Catholic Action) as a non-political lay organization under the direct control of bishops. The organization was forbidden by the Vatican to participate in politics, and thus was not permitted to oppose the fascist regime. Pius XI ordered all Catholics to join Catholic Action. This resulted in hundreds of thousands of Catholics withdrawing from the Partito Popolare, and joining the apolitical Catholic Action. This caused the Catholic Party's final collapse. When Mussolini ordered the closure of Catholic Action in May 1931, Pius XI issued an encyclical, Non Abbiamo Bisogno. This document stated the Catholic Church's opposition to the dissolution, and argued that the order "unmasked the pagan intentions of the Fascist state". Under international pressure, Mussolini decided to compromise, and Catholic Action was saved. For Catholics, the encyclical's disapproval of any system that puts the nation above God or humanity remains doctrine. The Vichy regime in France was also deeply influenced by the reactionary Catholic-influenced ideology of the Action Française. This group had actually been led by an agnostic and condemned by the Catholic Church in 1926. Many of its members were reactionary Catholics so this condemnation damaged the group, but then in 1938 the condemnation was lifted. Conversely, many Catholic priests were persecuted under the Nazi regime, and many Catholic laypeople and clergy played notable roles in sheltering Jews during the Holocaust. While some historians wrote that the Catholic organization Opus Dei and its founder Josemaría Escrivá supported the fascist regime of Spanish dictator Francisco Franco, some recent historians state that Escrivá was staunchly non-political, and the connection between Opus Dei and Franco's fascist regime was a black legend propagated by the Falange and by some clerical sectors. Protestantism in Italy and Spain was not as significant as Catholicism and the Protestant minority was persecuted. Mussolini's sub-secretary of Interior, Bufferini-Guidi issued a memo closing all houses of worship of the Italian Pentecostals and Jehovah Witnesses, and imprisoned their leader. There were some instances of people being killed because of their faith. The connection between the German form of Fascism, Nazism, and Protestantism has long been debated, with some saying that the Protestant denominations, especially the German Lutheran Church, was close. According to some scholars, especially Richard Steigman-Gall (The Holy Reich: Protestantism and the Nazi Movement, 1920-1945) the relationship was collaborationist. Hitler, in his manifesto, Mein Kampf, listed Martin Luther as one of Germany's great historic reformers. In Luther's 1543 book On the Jews and Their Lies, Luther advocated the burning of synagogues and schools, the deportation of Jews, and many other measures that resemble the actions later taken by the Nazis. The overwhelming majority of Protestant church leaders in Germany made no comment on the Nazis' growing anti-Jewish activities. Many Protestants opposed the governments of the Weimar Republic in the 1920s which they saw as coalitions between the Socialists and the Catholic Centre party. In 1932, many German Protestants joined together to form the German Christian Movement which enthusiastically supported Nazism, and sought to join Church and State. 3,000 of the 17,000 Protestant pastors in Germany were to join the movement. Hitler wished to unite a Protestant church of 28 different federations into one nationalist body. Pastor Ludwig Müller, the leader of the German Christian Movement, was soon appointed Hitler's advisor on religious affairs. He was elected Reich's Bishop in charge of the German Protestant churches in 1933. Many churches and ministers attempted to purge Christianity of "Jewish influences" and tried to institute the Nazis' Positive Christianity viewpoint on religion. An "Aryan Paragraph" was introduced to the constitution which stated that no one of non-Aryan background, or married to anyone of non-Aryan background, could serve as either a pastor or church official. Pastors and officials who had married a non-Aryan were to be dismissed. Much of the Lutheran establishment and most of the Reformed churches in Germany had welcomed Hitler's promise to oppose Bolshevism and social instability. The new measures began to raise some opposition to the German Christians from a minority of Lutherans and Evangelicals who had become increasingly disillusioned with unethical practices of the Nazis and disliked state interference in church affairs. Dietrich Bonhoeffer, a Lutheran pastor and theological liberal, was strongly opposed to the Nazis. Though there is some debate as to his actual involvement in planning the assassination attempt of Hitler, he was found guilty and executed for his alleged part in the conspiracy. A small group of Protestant clergy under Martin Niemoeller and Dietrich Bonhoeffer separated from the main churches to form the Confessing Church. The group had limited effect, however, as it was forced to meet secretly and was largely dispersed by the Nazis by 1939 at the latest, and the effect of Protestantism on inhibiting Nazism in Germany was limited at best. See Mohammad Amin al-Husayni for ties between the Grand Mufti and WWII fascists. For contemporary issues, see Neofascism and religion; and the disputed term Islamofascism. There are a number of regimes and movements that are alleged to have been either fascist or sympathetic to fascism. It is often a matter of dispute whether a certain government is to be characterized as fascist, authoritarian, totalitarian, or a police state. See also Fascism and ideology and Economics of fascism. The references in this article would be clearer with a different and/or consistent style of citation, footnoting or external linking. Please see the relevant discussion on the talk page for further details. There has been a revival of interest in recent times, among many academic historians, with regard to the so-called "cult of masculinity" that permeated fascism, the attempts to systematically control female sexuality and reproductive behaviour for the ends of the State. Italian fascists viewed increasing the birthrate of Italy as a major goal of their regime, with Mussolini launching a program, called the ' Battle For Births', to almost double the country's population. The exclusive role assigned to women within the State was to be mothers and not workers or soldiers. Fascists have generally been opposed to the concept of women's rights per se, preferring the traditions of chivalry to guide male-female relations. According to Anson Rabinbach and Jessica Benjamin, "The crucial element of fascism is its explicit sexual language, what Theweleit calls 'the conscious coding' or the 'over-explicitness of the fascist language of symbol.' This fascist symbolization creates a particular kind of psychic economy which places sexuality in the service of destruction. According to this intellectual theory, despite its sexually-charged politics, fascism is an anti-eros, 'the core of all fascist propaganda is a battle against everything that constitutes enjoyment and pleasure'… He shows that in this world of war the repudiation of one's own body, of femininity, becomes a psychic compulsion which associates masculinity with hardness, destruction, and self-denial." See: Neo-Fascism; Neo-Nazism; Neofascism and religion; Fascism and ideology; Christian Identity; Creativity Movement; Ku Klux Klan ; National Alliance; Nouvelle Droite; American Nazi Party; Alain de Benoist; William Luther Pierce; George Lincoln Rockwell; Producerism.